Easy to Switch! You make a decision, we make it happen. 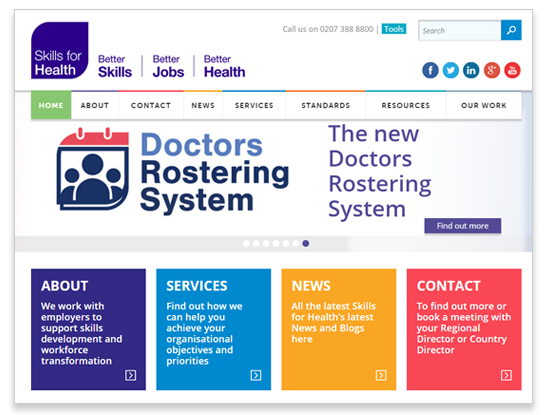 With e-rostering now the preferred approach for organising staff rotas, NHS trusts across the UK are set to benefit from further developments to our existing Doctors Rostering System (DRS). At a time when the need for efficiency savings to be made has been so widely emphasised, not only in hospitals across the NHS but for a wide range of organisations, e-rostering is also seen as an effective means of ensuring good people management practices are in place and that staff are deployed in the most productive way. Engaging all staff in the challenge to make greater efficiencies has also been highlighted as a key element in further improving delivery targets. As a trusted provider of healthcare solutions across the UK, and with safe staffing and patient safety issues in mind at all times, Skills For Health has therefore enhanced its current workforce management systems to provide not only a cost effective, accurate and efficient system when it comes to doctors rostering, but also around general staff rostering too. 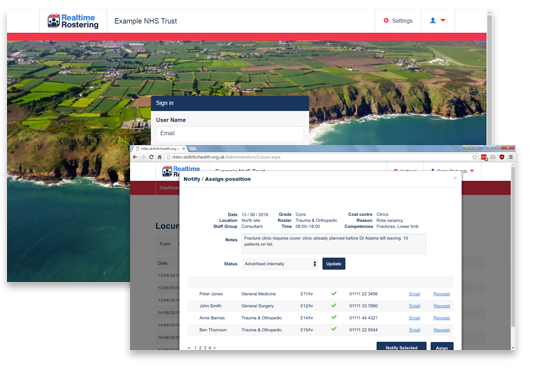 The Realtime Rostering solution is now also available across Fire and Rescue, Justice and Police sectors. Developed by industry experts, the new technology consolidates information around shift preferences, sick leave, holidays and other staff movements in one place. E-rostering can help reduce agency spend and has been known to achieve zero reliance on agency provision in some cases. By ensuring adequate cover is secured well in advance, the technology also helps ensure staff morale and the overall demands of the Working Time Directive are maintained across all staff groups, even during busy times. 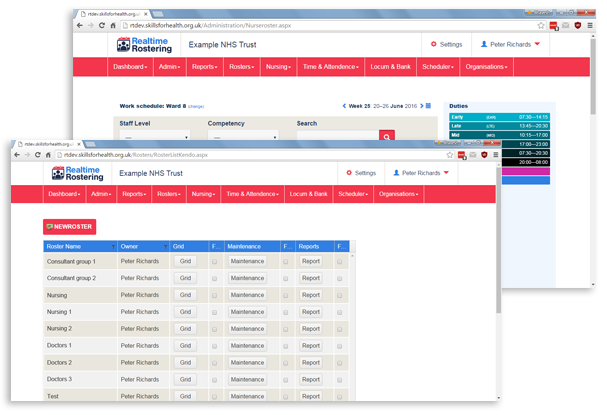 As such, the new Skills For Health Realtime Rostering system will provide trusts with an additional ‘Duty Rostering’ facility for all staff, an ‘Events Planner’ for overseeing appointments, clinics and other activities, and a ‘Locum’ schedule showing when cover may be required – all of which are quick, simple and easy to use. 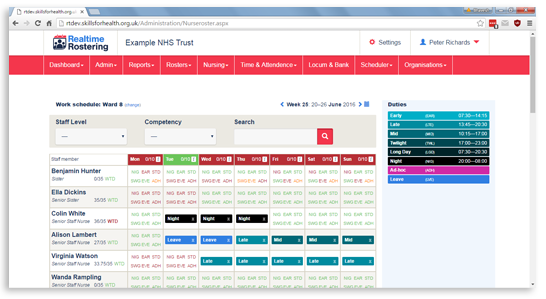 Already compliant with the new 2016 Junior Doctor Contract, the improved DRS4 module will also allow schedulers to check rota compliance against the Working Time Regulations (WTR), and even flag up where and why a given work pattern fails current guidelines. The task of consultant job planning will also be simplified, with a more comprehensive overview of events enabling recurring activities to be assigned to an individual bearing their agreed job plan in mind. The introduction of an ‘Integrations’ facility allowing Realtime Rostering solutions to integrate seamlessly within existing third party systems (already used for HR, payroll, time and bank/locum facilities, for example) is also an essential element of this redevelopment, therefore. Opening up wider possibilities for e-rostering solutions to enhance theatre management, for example, and anesthetic rostering systems too, this facility also makes the transition to e-rostering for all as easy and straightforward as possible. Based on the successes of e-rostering systems to date, many trusts are already reaping the benefits of a solution which has been produced by industry experts to ensure staff are deployed in the most productive way - and that ultimately a more balanced view of people and financial performance is made available across the board. The provision of a central data hub and single interface compatible with existing systems is set to prove crucial in retaining frontline services, therefore, and is something Skills for Health as a leading provider operating on a Not for Profit basis is committed to ensuring continuously meets the practitioner’s needs. With NHS budgets requiring greater efficiencies than ever before, e-rostering is proving crucial in helping trusts nationwide maximise on resources by increasing visibility across the board and ultimately preventing understaffing through better forward planning. To discuss your Rostering requirements or to find out more please contact your Regional Director or Bhavesh Patel (0207 391 7180) the Realtime Rostering - Product Manager.